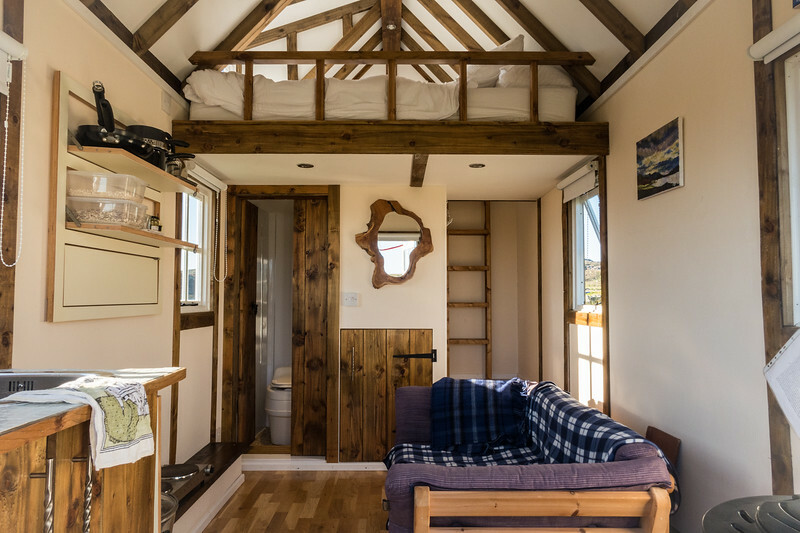 Have you ever wondered about living in a tiny house? 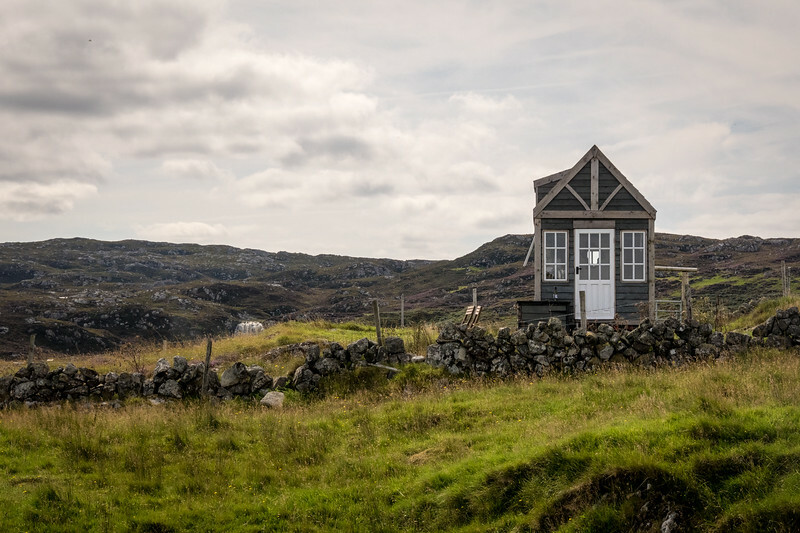 Debi Lander, one of our favorite guest contributors, shares her tiny house experience on an off-the-beaten-path trip in Scotland. You’re going to love it! The tiny house in Clashnessie, Scotland. Most of my friends say I live large, but I hold a fascination with small things: dollhouses filled with teensy furniture, appliances and faux food; an infant’s hand grasping an adult’s fingers; darling baby animals, even newborn honey badgers. I’m not alone in this seduction. Miniature collectibles attract hordes of hobbyists around the world. Perhaps the infatuation with little things led to the rise of Tiny House Nation, a TV series depicting the lives of people adapting to 250-500 square foot houses. Having watched it, I was intrigued by the concept and decided to jump, or maybe the better word is squeeze, into a tiny house for a visit. I envisioned a unit filled with hidden storage compartments, clever built-ins, and perhaps a pull-down Murphy bed. Researching lodging options for an extended European adventure uncovered a likely looking rental. I knew I was pushing the limit on rural jaunts, but Judy, a stanch urbanite, surprisingly agreed. We’d already explored big cities like Istanbul, Budapest, Rome and Paris, so allotting time for bucolic countryside seemed fair. Plus, we needed a do-nothing getaway, time to relax and sleep. A retreat to the tiny house joined our itinerary. After an unsuccessful quest to find the monster in Scotland’s Loch Ness, we headed northwest. Departing from Inverness, we allowed three hours, having been forewarned that the last seven miles covered a single-track road. 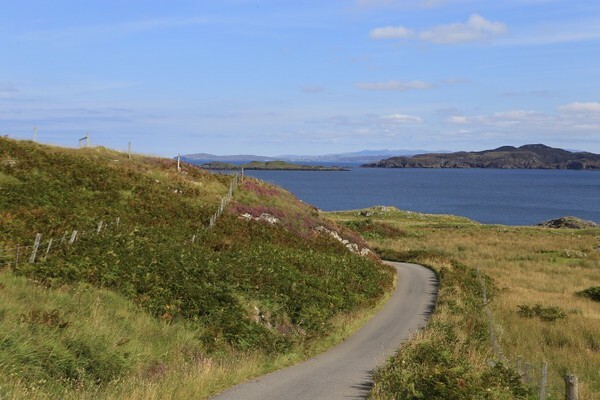 Our goal: Clashnessie in Assynt, a place so remote that most Scots haven’t heard of it. Getting to the tiny house is quite an adventure. With trepidation, I spun the rental car up, down, and around the dual carriageway, a road sporting one lane in each direction. We passed through fog-shrouded mystical Scottish landscape in Cairngorms National Park. Then, tackled the most northerly stretch of NC500, ‘Scotland’s answer to Route 66’. The road, aptly described for “adrenaline junkies,” ranks as one of the six most scenic coastal roads in the world. The scenery proved breathtaking in the literal sense of the word. Judy nearly turned blue, holding her breath as I snaked around blind curves and beside sheer cliffs lacking guardrails. I zigzagged around crystal clear lochs or lakes, some with tiny islands sprouting a lone tree, drove by moors and crags, and occasionally spied the ruins of a castle. Passing places allow drivers to pull over to let the other vehicle pass on a one-lane road. 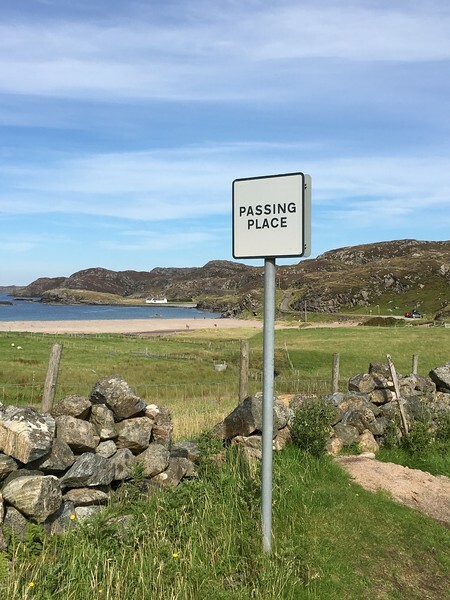 “Passing Places” became saviors. The 6-12 inch wide gravel cutouts allowed drivers to scoot over for an oncoming car. Whoever is closest to the passing place stops, and holds their breath while the other driver proceeds. Thankfully, in Scotland, everyone follows the rules. With an audible sigh, quick wave and a smile, the impossible occurs: two cars squeeze by each other only a fingernail apart. 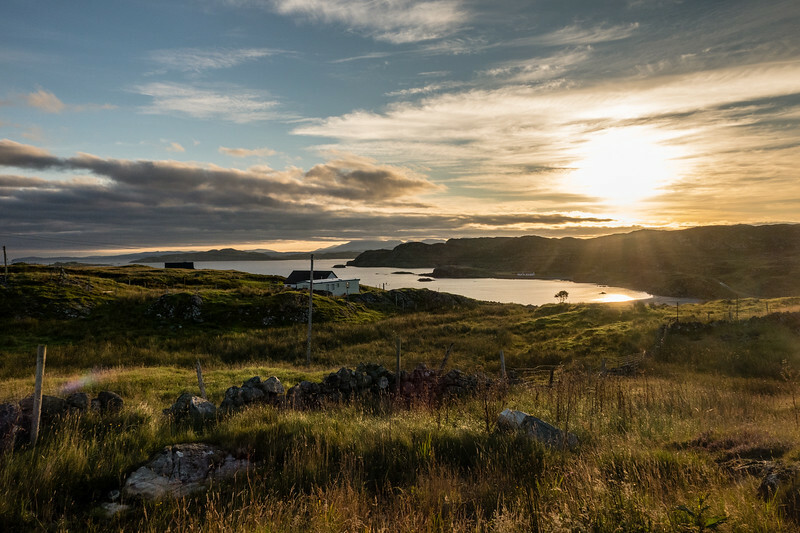 These hair-raising moments continued until we reached Clashnessie, a small crofting village overlooking the Atlantic Ocean. Here, lording over the grassy hill stood the garden shed-like Tiny House. As we approached the wood-sided dwelling, the owner and our Airbnb host, Pamela, greeted us. She reminded me of a woman you would want with you if stranded on a desert isle—very self-sufficient, no nonsense and clever minded. She took us in and showed us the living space, which pretty much took less than 5 minutes, since it was, well…tiny. This it! One photo captures kitchen, living, sleeping and bathroom space. The kitchen consisted of a sink, with running water and a cabinet underneath. Counter space was minimal, so two shelves held kitchen items on a nearby wall. The mini-refrigerator stood outside (yes, outside), beside the door, with fresh eggs, butter and bread provided. What appeared liked my old bread-making machine was a halogen oven, squeezed onto a ledge near the floor. It emits a strange glow that miraculously cooks food. We’d need to study the detailed instructions later. I would add, “Then, perform a gymnastic maneuver to rotate your body from vertical to horizontal.” Standing is not possible, even a child needs to crawl up there. I made it to the loft but Judy would not, citing her nightly 3:00 a.m. potty break where the risk of ladder missteps and bladder mishaps were inevitable. She opted to sleep in the sofa/futon bed below. The bathroom contained a composting toilet, one that separates the liquid from the dry. Don’t ask. A slim recessed tiled area for showering included a hand-held sprayer affixed to the wall beside the toilet. The shower also washed the potty, toilet paper, walls, and floor. Basically, the bathroom was the shower stall. Our August stay avoided the need to fire-up the pot-bellied stove for added warmth. However, ventilation eventually became a problem. If we opened the dollhouse-sized screen-less windows, armies of midges, those dastardly no-see-um insects that bite with a vengeance, flew in. For dinner, a grocery store rotisserie chicken rescued us. All we needed to cook were sweet potatoes and open a much-anticipated bottle of wine. Setting up the collapsible table and chairs, however, caused a struggle. Hinges wouldn’t stay open or snap into place. We looked as befuddled as new grandparents setting up a Pack N Play crib. The house may be tiny but the landscape is expansive. The bottle of wine was consumed while gazing up at the no light pollution, glorious black starry sky and we called it a night. 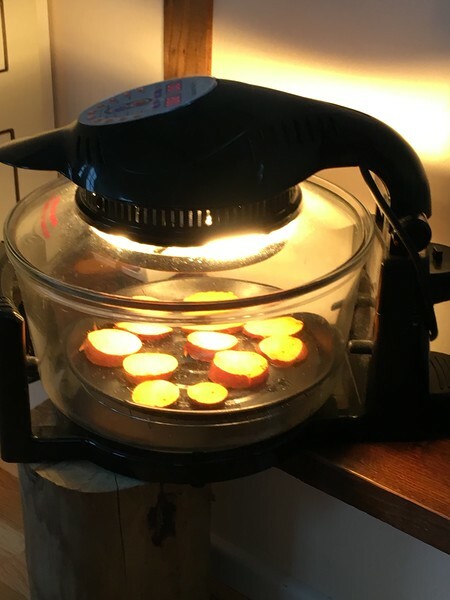 Experienced with the cooking technology, breakfast eggs sizzled and bread toasted in the halogen contraption. But, we feasted off plates on our lap while seated on the sofa; forget the table and chairs. A highland cow poses for the camera. Lazing in bed proved not very comfy, and with no Wi-Fi or TV for entertainment, we ventured out to explore the village. Rounding a corner brought an unexpected herd of friendly Highland cows. 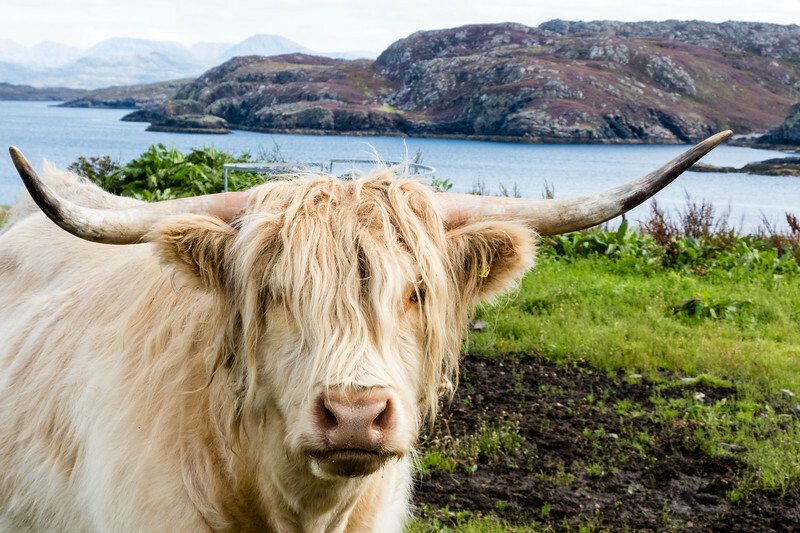 I swear one hairy cow posed as if he wanted to star in the annual Highland Cow calendar, a hot item in all the tourist shops. Packing leftover chicken sandwiches, we strolled down toward the shimmering turquoise bay, looking out at the wavy Atlantic Ocean. No surprise, we were the only picnickers at the rocky inlet and wide, sandy beach. The water stung too cold for anything more than ankle-high wading. Did they really phone home? 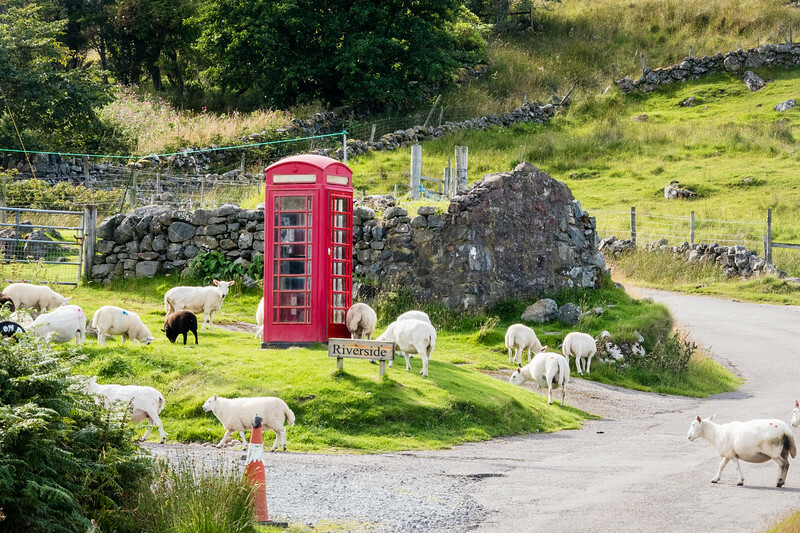 Climbing the path back up the hill, a vast herd of Cheviot sheep created an almost insurmountable roadblock, Clashnessie’s community common grazing rule allows free range, so they had congregated at the red English telephone booth in a most unorthodox location. The sheep appeared to be waiting in line to place a call to maaa. The incongruous scene remains one of my favorite memories, the essence of serendipitous travel. 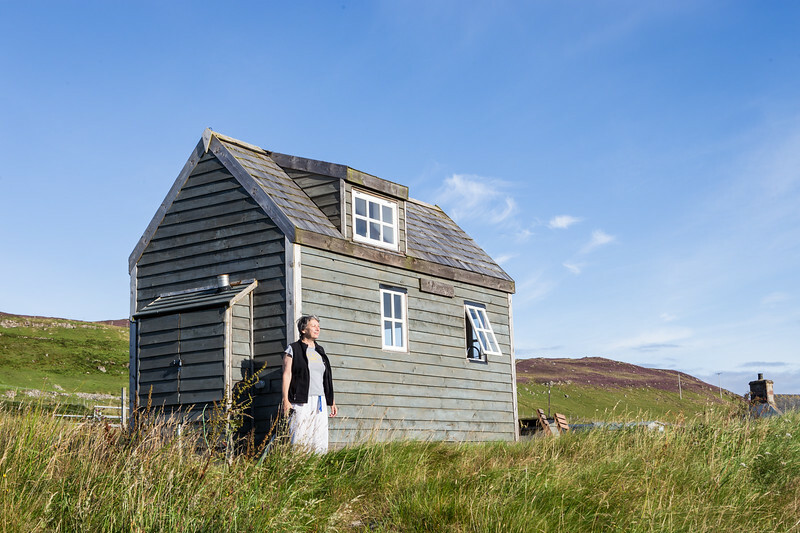 If a tiny house isn’t for you, start your search for hotels in Scotland with us. Have you stayed in a tiny house while on a boomer travel adventure? Come join the conversation at the My Itchy Travel Feet page on Facebook. Or send us an email with your thoughts. Disclosure: Affiliate links are included for your convenience. However My Itchy Travel Feet receives a small percentage of the sale at no additional cost to you. Debi Lander hails from St. Augustine, FL, and is a freelance travel and food writer/photographer. She is the mother of four and Grandmother Mimi to eight. By air, by land or sea, Debi's always ready to explore at ByLanderSea.